Rainer Aliochin is Chief Operating Officer at AAU e.V. in Nürnberg, Germany. He is also the project head at XeneX, where his work consists of consulting start-ups of existing immigrants in Germany, for immigrants who are abroad and want to move to Germany, and for refugees. XeneX is an IQ-MigraNet Project. He is also an enterprise coach for small and medium-sized enterprises (SMEs) regarding the employment of an international workforce. Mr. Aliochin is the representative of the AAU e.V. in regional and supra-regional networks and a member of the nationwide IQ-issue group “Migrantenökonomie” (migrant economics). 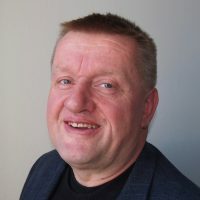 He is guest lecturer at the University of BA, Mannheim, audited trainer in accordance with AEVO, a member of an examination board at the IHK (Chamber of Commerce) Nürnberg and acts as a consultant for start-up coaching initiatives of the BAFA (Federal Office for Economic Affairs and Export Control). Mr. Aliochin completed a vocational education as industrial manager and received a Diploma in Business Administration from the University of Applied Science Nürnberg. Partizip is an AAU e.V. program that offers day to day support for the integration of new immigrants and refugees. Entrepreneurs face special challenges when hiring and training newly-arrived refugees and immigrants at their businesses. Partizip supports this endeavor by fostering the social and intercultural skills of the workforce. The goal of the project is to sensitize Human Resources departments to intercultural communication in general, but also specifically with regards to the situation of newly-arrived refugees and immigrants. In consultation with businesses, AAU e.V. identifies intercultural challenges in companies and what support would be helpful for them. Partizip offers seminars and workshops on intercultural understanding; communication tips and techniques to avoid misunderstandings and conflict; informational materials about the situation of newly arrived immigrants and especially refugees; information about residency laws and legal issues; exchange within the network; establishment of tandems, and consultation appointments and individual evaluations with all participating companies. Among the many programs AAU e.V. manages in the IQ Network Bavaria MigraNet Project, AQua—Recognition through Qualification (Anerkennung durch Qualifizierung) offers immigrants an opportunity to finish their partially completed vocational formation through targeted, adaptive qualification measures. The “AQua” Project supports persons with partial equivalent vocational qualifications to fulfill whatever is lacking in their qualification, with reference to their desired career. This can be a lack of theoretical knowledge or a lack of practical work experience. The goals for the initiative are achievement of full equivalent education by those with a partially complete education, development of marketable skills (through formal certification or increased competitiveness in the job market), and development of individual and tailored adaptive qualification training. Target groups for AQua are immigrants with “partial” recognition (as certified by the Chamber of Industry and Commerce Foreign Skills Approval [IHK-FOSA]), as according to the Professional Qualification Assessment Act (BQFG) and persons who are not likely to succeed in having their vocational training recognized. You can learn more about AAU e.V.’s IQ Network Bavaria MigraNet Project at http://www.aauev.de/project/iq-landesnetzwerk-bayern-migranet-projekte-des-aau-e-v/.